George Washington, Thomas Jefferson, Theodore Roosevelt, and Abraham Lincoln each enjoy representation on the magnificent achievement known as Mount Rushmore National Monument. 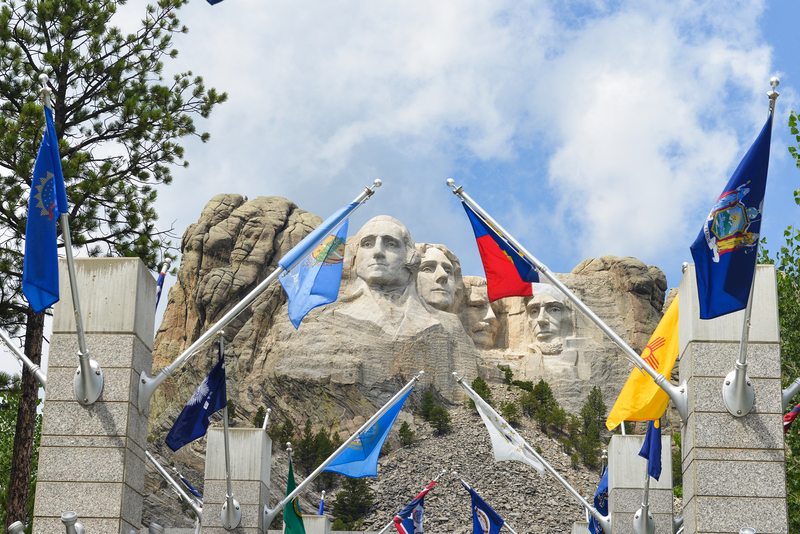 Constructed between 1927 and 1941 in effort to represent 150 years of United States history, the memorial encompasses almost 1300 acres of land and rises a whopping 5725 feet above sea level as it rests in the heart of the Black Hills region. First conceived by Doane Robinson as a tourist attraction for the great state of South Dakota, the park has seen numerous improvements and restructuring over the years that have seen his dream realized. Today, Mount Rushmore National Memorial in South Dakota boasts a visitor center, museum, places to eat, and the site hosts thousands of people annually during the Sturgis Motorcycle Rally, the Rushmore Music Camp final concerts, and the yearly Independence Day Celebration among other events. What visitors see today took decades to achieve by the onsite sculptor Gutzon Borglum, his son Lincoln, and a drove of dedicated miners, rock climbers, sculptors, and demolition experts. The first carving began in 1932 and was of the nation's first president, George Washington. Completed in seven years, this portion of the monument was dedicated on July 4, 1934. Jefferson was next, but his first head was actually demolished because Borglum was displeased with the granite's quality. In 1936, Jefferson's section was finally complete. Abraham Lincoln's beard gave the workers a new challenge, but they completed the task by 1937. Theodore Roosevelt's portion was under construction as the earliest in-park amenities and services were being constructed for Mount Rushmore's visitors. Completion of his head in 1939 did not actually signify the completion of the monument. Borglum's plan for a Hall of Records had not yet been realized when he suddenly passed away in 1941. The Hall of Records wasn't a reality until 1998 after surviving members of Borglum's family managed to convince the National Park System to forge ahead at least partially with his plans. The Hall of Records is a titanium vault with porcelain panels containing important historical documents like the US Constitution and the Bill of Rights. This hidden time capsule is not open to the public, but sure captures the imagination. Borglum Visitor Center and Museum Attractions – Throughout the summer season, numerous ranger-led activities are offered for explorers of all ages. Discover the vast options at the Lincoln Borglum Visitor Center, which is also home to the Lincoln Borglum Museum. The museum answers the most common questions park visitors ask, and houses two theaters where short films offer a historical introduction to the park. Inside the museum are interactive exhibits that detail the development of these enormous statues. Those wanting to take an informative self-guided tour of the monument can pick up a headset at the Borglum Visitor Center to enjoy an audio tour. Sculptor's Studio – Constructed as a second studio for Gutzon Borglum, visitors can see some of the plaster models and carving tools that were used during the creation of the monument. Learn more about the process of mountain carving through park offered interpretive programs led by rangers. The studio is closed from October through April, but open daily otherwise. The Presidential Trail is an easy walking trail and boardwalk that begins at Grandview Terrace and crosses through the forests towards the sculptor's studio. Hiking in Mount Rushmore – Park hikes in warmer months often lead to wildflower gardens of aromatic Vervain and Blue Flax beneath the towering Ponderosa Pines and massive aspen and spruce trees so common to the Black Hills. Snow filled landscapes typically dominate in the wintertime; however, the scenery is remarkable year round. Depending on the season, small red squirrels, wild turkeys, balk eagles, Bighorn Sheep, and Rocky Mountain Goats may be seen on the trail ways if one hikes quietly enough. There is no camping or lodging in Mount Rushmore proper, but there are ample lodges near Mount Rushmore with comfortable accommodations and plush amenities. The nearby communities of Sturgis and Keystone are just miles away and feature some premium lodges near Mount Rushmore fit for any President. Rest easy after a day of exploration at the premier President's View Resort. This Keystone lodge near Mount Rushmore offers both chalet and suite-style accommodations and have added a new floor filled with luxury suites with kitchens, living rooms, fireplaces, balconies, and other posh touches. The newest Mount Rushmore lodging option is the White House Resort, which also lies in the heart of Keystone. Considered the gateway to the monument, guests enjoy spacious rooms with lavish amenities including a delectable restaurant. Mt. Rushmore's Chalets have crafted the ideal environment for those seeking lodging near Mount Rushmore for large groups or families. These deluxe accommodations offer the best views of the monument and are just minutes away from best activities and attractions in the Black Hills. Another respite for large parties is the Palmer Gulch Resort, where activities including horseback riding, swimming, and biking are part of the package.